"If you don't undertake meaningful action to reduce pharmaceutical costs, policy-makers are going to do it for you," U.S. senator tells top drug company executives. Channeling the ire of constituents and drawing from personal experience, U.S. senators chastised drug company executives Tuesday over the high cost of prescription medications, while the pharmaceutical CEOs warned that government price controls could stifle breakthroughs on diseases like Alzheimer's disease. The Senate finance committee hearing marked the first time lawmakers have called the industry's top executives to account for rising prices considered a drain on U.S. government health programs Medicare and Medicaid — and a burden to millions of Americans. The extraordinary public accounting was a sign that Congress and the White House are moving toward legislation this year to curb costs. Are low-priced drugs becoming an endangered species? Republican Senator Johnny Isakson, who has Parkinson's disease, said the cost of one of his longtime medications had jumped by $90 US when he went to refill it recently. "I can't explain it," said Isakson, who credits prescription drugs for allowing him to keep working. He started making calls and found a whole range of prices for the medication. The second-ranking Senate Republican, John Cornyn of Texas, expressed disbelief that Humira, a blockbuster drug by AbbVie for immune system conditions, is protected by more than 130 patents that cumulatively translate to decades of roadblocks for generic competitors. AbbVie CEO Richard Gonzalez responded that each new FDA-approved use of the drug represents an investment by the company in research, even if the medication is the same. "At some point that patent has to end so that the patient can get access to that drug at much cheaper cost," Cornyn said. Drug costs are squeezing Americans in a number of ways: New medicines for cancer and other diseases often launch with prices exceeding $100,000 US per year even as employers are shifting more pharmacy costs onto workers. Less expensive drugs for common ailments like diabetes and asthma often see price hikes of around 10 per cent annually. Meanwhile, some drug makers have been buying up the rights to once-cheap medicines and hiking prices by 1,000 per cent or more. The pharmaceutical executives expressed a general desire to lower costs for patients, but made no firm commitments. Merck CEO Kenneth Frazier warned that "outrageous solutions" could sacrifice industry innovation. He said lung cancer patients in the U.K. are still waiting for a drug available in the U.S. that can cut deaths in half among those newly diagnosed. Sanofi CEO Olivier Brandicourt said using government "price controls" would not be enough to make medicines affordable. New Jersey Democratic Senator Bob Menendez, considered an ally of the industry, delivered what he called a friendly warning: "If you don't undertake meaningful action to reduce pharmaceutical costs, policy-makers are going to do it for you." Committee chairman Charles Grassley, a Republican senator from Iowa, said Congress intends to respond to the drug price problem in a "measured and effective way," and he is planning to question other industry actors including health insurance companies and middlemen called pharmacy benefit managers. In addition to Merck, Sanofi and AbbVie, other companies represented at the hearing included AstraZeneca, which makes the cholesterol drug Crestor; Bristol-Myers Squibb, maker of the blood thinner Eliquis; Johnson & Johnson, maker of Xarelto to prevent blood clots; and Pfizer, maker of Lyrica for nerve pain. "We recognize that the current state of drug pricing in the U.S. health care system is not sustainable and that patients are facing increasingly high out-of-pocket costs," AstraZeneca CEO Pascal Soriot said in prepared remarks. "We believe that these issues must be addressed urgently, and we hope to be a constructive partner in finding solutions." Ranking Democrat Ron Wyden of Oregon said in his prepared statement, "You pharma executives are here because the way you do business is unacceptable and unsustainable. Ten companies accounted for half of all profits in the health care sector last fall. Nine of those 10 were drug manufacturers." Democrats say it's time for Medicare — the federal health insurance program for American seniors — to leverage its purchasing power and directly negotiate prices with the industry, a step most Republicans oppose. 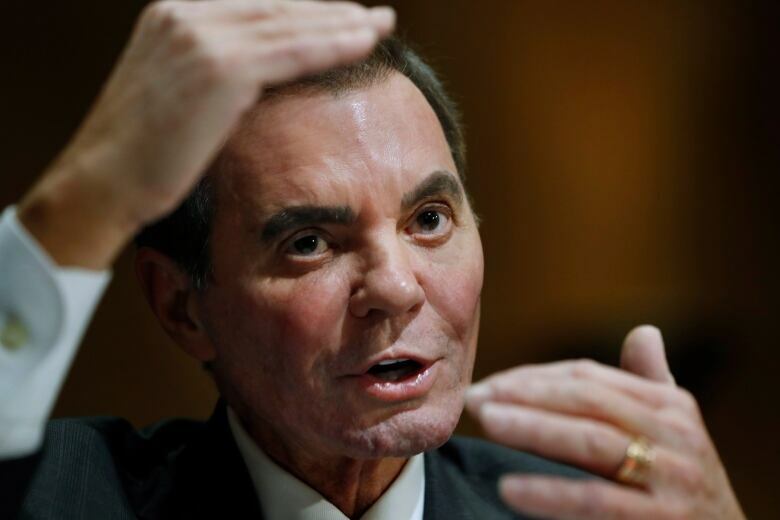 The pharmaceutical industry is one of the most powerful lobbies in Washington. Drug makers' top lobbying arm, the Pharmaceutical Research and Manufacturers of America, spent a record $27.9 million US last year to sway federal decision-makers, according to records tallied by the non-profit Center for Responsive Politics. But Tuesday's hearing seemed to mark a change in direction. U.S. President Donald Trump's recurring blasts at drug makers appear to be closer to finding a pathway to legislation. Drug makers pointed a finger at other industry players like pharmacy benefit managers, who are paid rebates to help assure favourable treatment for a medication on an insurer's list of covered drugs and help keep premiums lower. But the rebates are not passed on to consumers who use the particular medication, and they can face high co-pays based on the drug's list price, not the discounted one. Allow patients to share in rebates when they buy their medication, a policy proposed by the Trump administration. 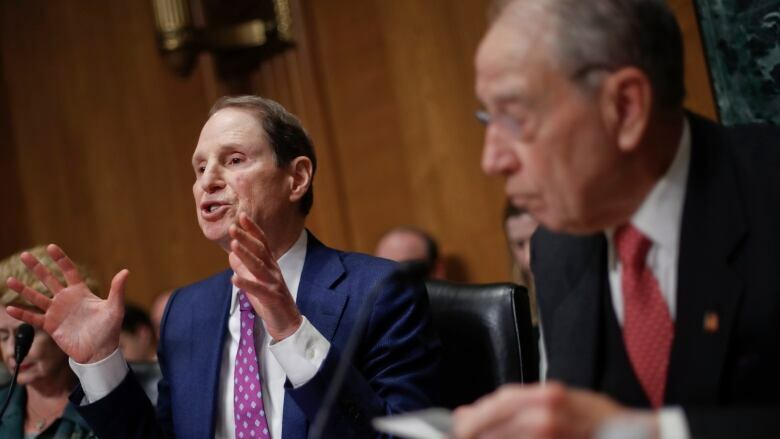 Place a hard limit on cost-sharing and co-pays for Medicare beneficiaries in the popular Part D prescription program, a change supported by Democrat Senator Ron Wyden. Make greater use of value based contracts that tie payments for a medication to how well it delivers results. Promote the introduction of lower-cost generics and biosimilars, competition that brand manufacturers are often accused of impeding.